This app helps you make decission when choosing a technology for your next cool project, by providing you stats about community engagement - knowing how many questions got asked and how many of them were answered for a particular technology can give you a rough idea about possible support in future when you'll have trouble with something. I've created this app for my own purpose when I had to choose a js framework for client side, but quickly realised that this could be useful for other developers. It performs search queries to /questions and /questions/unanswered with tags= and filter=. Then it caches the results in my database and presents them as infographics: the larger the circle the more questions it found, and the greener it is the higher ratio of answered questions (while red color indicates unanswered questions). It's available for free on my website. 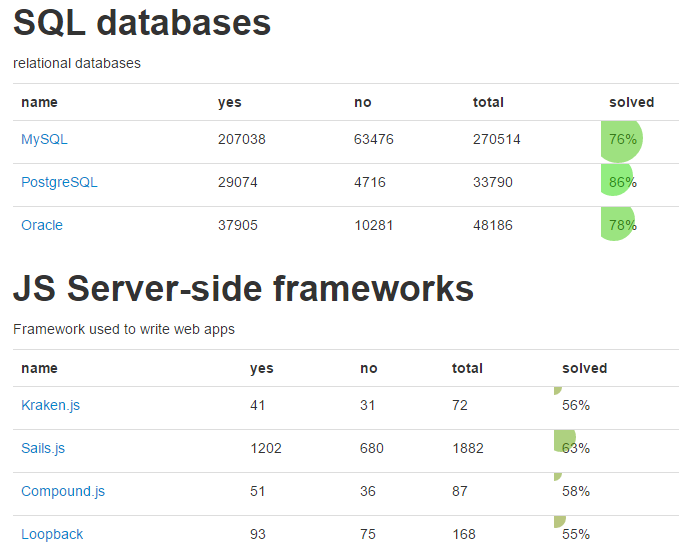 PHP, mysql, bootstrap.css, cURL. The code is ugly, and dead simple, but I am too shy to present it to you. Browse other questions tagged app website stackoverflow .